Participants constituted a virtual Who’s Who of the CEE legal world. Regional experts included Patricia Gannon (the co-founder of Karanovic & Nikolic), Ron Given (the managing partner of Wolf Theiss Zagreb), Michael Mullen (partner and head of CEE Legal at PriceWaterhouseCoopers), Hugh Owen (senior partner, head of SEE Desk at Allen & Overy), Willibald Plesser (partner, co-head CEE/CIS Group, and country partner for Turkey at Freshfields Bruckhaus Deringer), Andras Posztl (managing partner in Budapest for DLA Piper), Helen Rodwell (managing partner in Prague and Head of Corporate Practice for CEE at CMS), Adrian Roseti (managing partner in Bucharest, Drakopoulos Law Firm), David Shasha (senior consultant, Watson, Farley & Williams), Jonathan Weinberg (partner and head of Banking & Finance for CEE and CIS, White & Case), Joerg Menzer, (managing partner with CEE responsibilities at Noerr) and Perry Zizzi (partner at Dentons). Joining them was a select group of senior in-house counsel as well, including Budai from Invitel, Jelena Madir (senior counsel at the EBRD), Ingo Steinwender (the Group Head of Legal Affairs at CA Immobilien Anlagen), Agnieszka Dziegielewska-Jonczyk (country legal counsel for Poland at Hewlett-Packard), Christopher Fischer (associate general counsel and head of Legal EU Region at Western Union), and Alexey Amvrosov (head of Legal, IBM Russia/CIS at IBM). Mike Mullen, who has been in Central Europe since the late 80s, was impressed: "This was the first, largest and most important gathering of senior legal professionals and in-house counsel from the CEE region. Such a gathering was, to my knowledge, unprecedented and extremely valuable to both gauge the market and share approaches to the changing legal and business environment. I look forward to more of these opportunities facilitated by our gracious hosts from CEE Legal Matters." Preparation for the event began in early November, when participants were asked to prepare special essays summarizing their thoughts and perspectives on the State of the Region. These essays were collected and served as the basis for the 3 December Summit, which featured a special Round Table conversation. Critical subjects addressed included the effect of the ongoing conflict in Ukraine and Russia on the long-term potential of both countries both for law firms and investors, Romania's rebound, the “losing luster” nature of the Turkish legal market for international law firms, the long-awaited arrival of Chinese investors into the region, the future of international and regional law firms across CEE, and much more. The essays — and a full report on the conversation itself — will be provided to subscribers in the special issue of the CEE Legal Matters magazine which will be sent out the first week of January 2015. 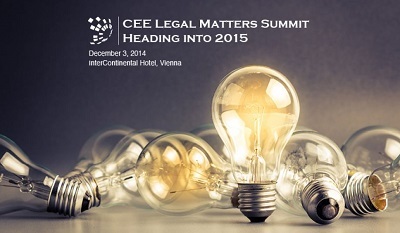 The 2014 CEE Legal Matters Summit was organized and hosted by CEE Legal Matters to celebrate its successful first year in business, and pursuant to its mission to inform and assist the lawyers in Central and Eastern Europe. Radu Cotarcea, the managing editor of CEE Legal Matters, described the event as a great success: "We were honored by the participation of some of the leading experts in the region from both the private practice world (representing some of the most reputable firms working in CEE), as well as from the in-house world from leading companies operating in our jurisdictions. We are excited for this to be the first in many such gatherings and the great feedback we've received so far can only fuel our plans to make this a recurring, and potentially growing event."